Now fifth place isn’t bad when one considers how many smartphone brands there are out there and how few groundbreaking features have shown up recently. And how all of the brands are fighting for differentiation in the marketplace and in the hearts of consumers. But the fact is that the LG brand has been moving down the list. The reason? Well, strange as it sounds, they were too techy, with features like early-adopter fingerprint scanners, dual-lens cameras and flash units before brands that were moving up the list had them too. What to do, what to do? The answer was K-I-S-S. Keep it simple. . . well, you know the rest and the South Korean company is anything but that. So last month they launched its G6 phone at Mobile World Congress in Barcelona, emphasizing the basics: a more hand-friendly design, more battery power, and a bigger screen. Prioritizing design. You know, the basics. Sales growth has slowed in the smartphone industry, and beyond improved cameras as a differentiator, the driving force behind consumer passion and brand loyalty hasn’t been more technology but a concentration on the basics. And LG seems to be promising less tech and more nuts and bolts. What Value Does A Fashion Brand Add? OK, let’s say you have a 100% cotton dress shirt. It was probably made in China or Indonesia or one of the 5 factories turning out virtually everything these days. As is, it’s going to sell at retail for $18 (OK, $18.99, but for the purposes of this exercise, let’s keep the math simple). If, for example, you were to affix a store-brand label to it, like Macy’s “Alfani,” the perceived value of the shirt goes up by about 9%, so the shirt can now be sold for $20. So as a retailer you just made an extra $2 that the customer was actually more than willing to pay, because the brand added value to what was just a 100% cotton dress shirt. That same shirt with a Ralph Lauren label could sell for $25 because the brand brings added-value of 34% to the product. And because brand added-value is mostly emotional, a customer’s favorite sports team adds 40%, which is why they can sell those sports jerseys for $50. And so it goes. 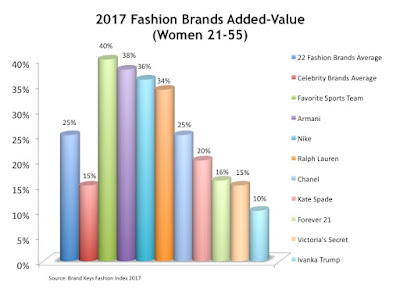 Nike adds 36%, while Forever 21 only adds 16%, or what works out to a difference of $5. For precisely the same shirt. Just a different label. According to our 2017 Fashion Brand Index, the average added-value across 22 brands was +25%. And sure, the high-fashion brands can start at a higher base price than store-brands for precisely the same shirt, but our analysis provides a reasonable emotional value brand-to-brand comparison. This year – for all the obvious reasons – we added “Ivanka Trump” (a brand that was never large enough to make previous lists, which are based on unaided consumer mentions) to our assessments. 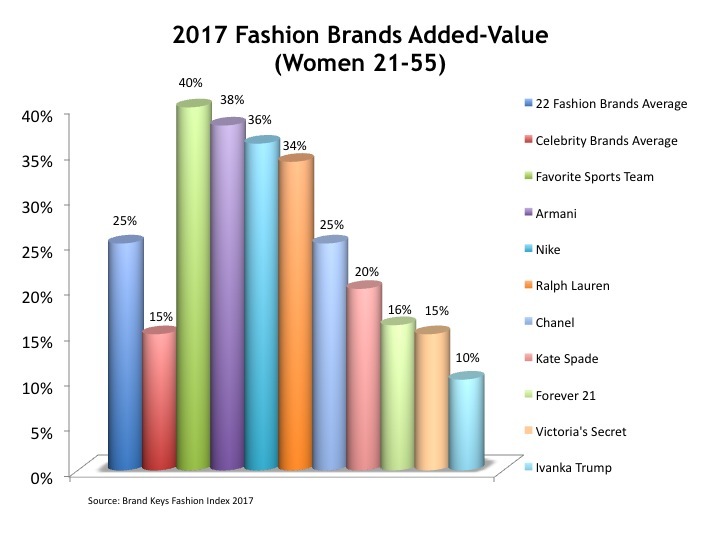 The Ivanka label added value of 10%, only 1% more than an established store brand. Being able to assess a brand’s ability to add value is critical, especially if the brand is planning on licensing everything it can put its name on. So maybe the Nordstrom decision to drop the Ivanka Trump brand was exactly what they said. Just a good business decision.